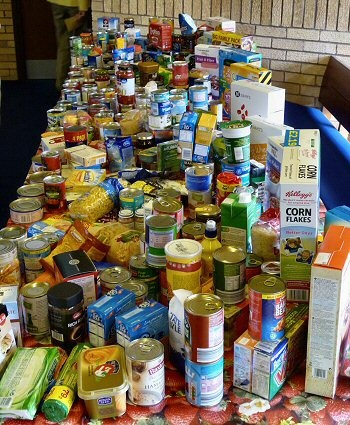 The Kirkcaldy Foodbank was founded in Dysart with support and supplies from the congregation. Ongoing supplies were able to be left during the opening hours of the Olive Branch Café each Thursday and at local supermarkets. A Ceilidh and Buffet was held in February to celebrate the 10th anniversary of the Taekwondo club. The previous week a 24hr Taekwondo exhibition kept everyone very busy. 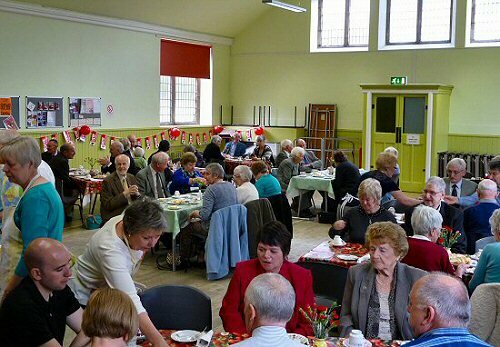 Our annual RNLI SOS Tea Afternoon raised over £1,600 with proceeds to the Kirkcaldy branch of the RNLI. The scones and cake were well received! In March, the second Presbytery-wide Celebrate and Discover Day was held again at Kirkcaldy High School. As well as stands from all the Churches there was music, a praise band, youth activities and arts competitions. 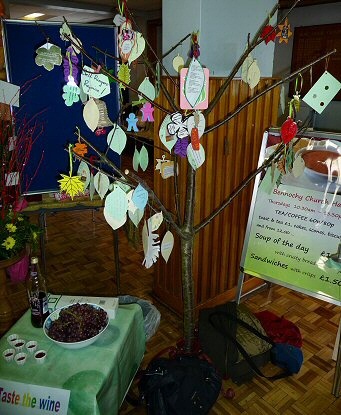 Each Church congregation was invited to create messaage cards in the shape of leaves for placing on each 'vine', as shown in the picture below. The Women's Group annual Bunny Drive in April was another great success this year raising nearly £300. 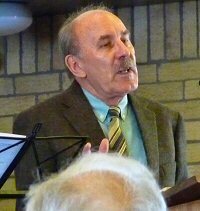 At the 11th May morning service we were joined by Malcolm Evans from Zambia, pictured below left. He updated us on the latest news from our Mission Partner, Jenny Featherstone in Choma and also delivered two money boxes made from Rosewood and Mukwa, the local hardwoods. 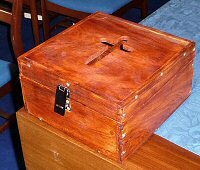 The boxes were commissioned from the Carpentry School in Chodart College, where we began the year by supporting Stanley S. Mweetwa over the year's course. However as he had to give up the course part way through we altered our support to Priscilla Handima on the Tailoring course. 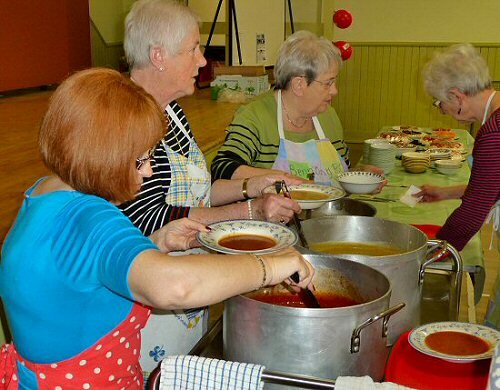 Christian Aid Week started on the 11th May in style with a Soup and Sweet Fellowship Lunch with all proceeds going to Christian Aid. Some pictures from the special lunch are shown below. A three course meal was speedily delivered with soup, sweet and tea/coffee being offered. 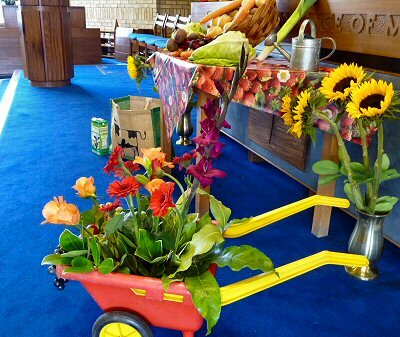 Summer services followed the pattern of previous years with a rotation around St. Bryce, Abbotshall and Linktown Churches with a theme of famous sermons from the mounts. At the service on 10th August, we were joined by the Revd. Steve Eason, senior pastor of Myers Park Presbyterian Church in Charlotte, North Carolina. Steve was attending the Scotland Connection 2014 conference in Kirkcaldy along with 11 other pastors from the USA. A Ceilidh was held as part of the conference at St. Columba's Church in Glenrothes. September marked the first anniversary of the Olive Branch Café. As part of the annual Fun and Find Out Day, an internet access facility was launched which is now available during the café opening hours and also provides free wi-fi - turning us into a full Internet Café! A section of the hall was setup with a selection of donated laptops to allow members of the local community to access web based services. The local MSP David Torrance formally opened the new facility. 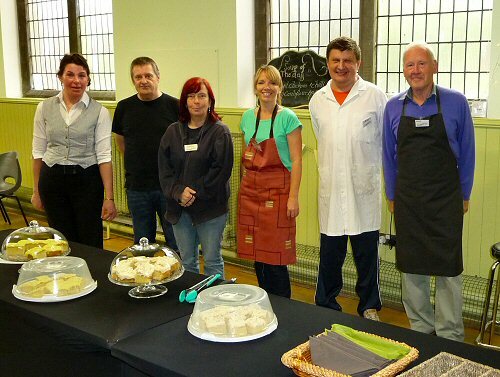 Members of the café team are shown below with a selection of cakes (which were free on anniversary day). The special Harvest Thanksgiving service marked the first use of the special wooden collection boxes made at our request in Zambia. They were used for a collection to raise funds to support our sponsored student at the college. As usual the Salvation Army was on hand to accept our gift of foodstuffs which will be added to the local foodbank supplies. Our annual Family Quiz Night in October, organised by the Women's Group, was once again a fun evening and included a dessert supper. 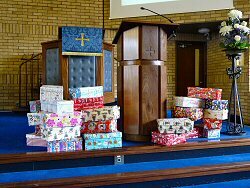 Support for the Blythswood Shoebox Appeal continued this year with a selection of Christmas boxes being filled and donated by the congregation for distribution in Albania, Bulgaria, Hungary, Romania and several other countries where there is a lot of poverty. Our annual gift day helped collect toys and other gifts for distribution around the Kirkcaldy area for Christmas by The Salvation Army. 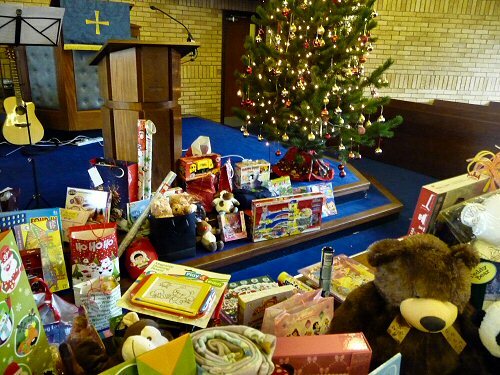 A picture of some of the gifts is shown below. 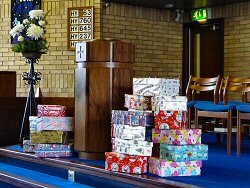 In total 92 boxes were donated by Bennochy Church, mostly for Eastern Europe. 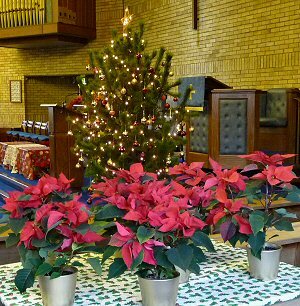 Poinsettias were displayed in the Church during the Advent services, each dedicated by a member of the congregation to remember loved ones. 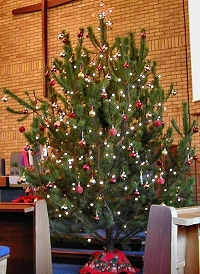 The plants were taken home after the Christmas service. Two new keep fit classes were started on Thursdays comprising Zumba Gold and Tai Chi. After the workouts a trip to the Olive Branch Café would likely be needed! If that was not enough, a new Monday night Zumba class was also inaugurated. Our annual Songs of Praise service was held at the beginning of March where members of the congregation were able to select a song and give a short introduction as to why it was chosen. This years RNLI SOS Tea Afternoon with a cake and candy stall, also in March, raised over £1,300 with proceeds to the Kirkcaldy branch of the RNLI. The Open Door team fundraiser event of the year was an auction of nearly 100 donated items - a great effort! During the summer a new heating system was installed throughout the Church with increased flexibility when used in the various halls. The Methven Hall stage was also removed and replaced with a new storage area. In September the Church hosted another Fun and Find Out Day which included the output from the first meetings of the new Quilting Group as well as food and childrens entertainment. Also providing musical delights were the newly formed Community Choir based on the popular TV series. All members of the local community are invited to take part regardless of singing ability! 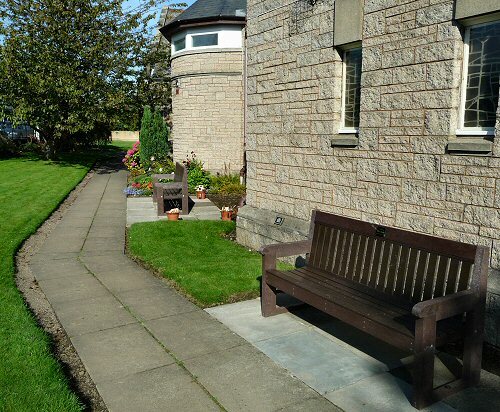 The gardens were also enhanced with two new benches, one dedicated to former long time congregation member Effie Cooper by her family. 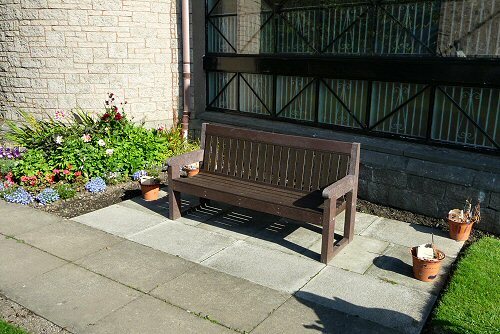 In the future it is hoped to grow vegetables as part of a Community Garden to complement the benches. 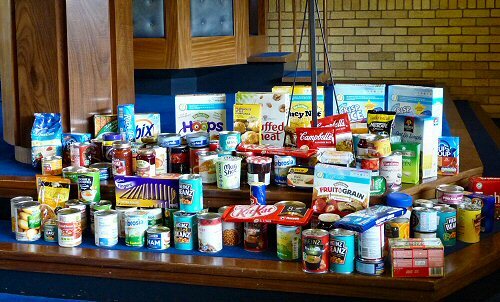 Our annual Harvest Thanksgiving service included dontations of foodstuffs (see below) which were sent to the local Kirkcaldy Foodbank. A special collection was also taken to support activities by our missionary Jenny Featherstone in Zambia. Our new childrens event, the Messy Church, was piloted earlier in the year and became a more regular event after the Harvest Service at the end of September. The Messy Church is for families and brings together creativity (crafts and getting messy! ), celebration (a time of informal worship) and offers hospitality (a shared meal together). The pilot of the Quilting Group was successful so a new weekly group has been formed and now meets on Monday evenings. We look forward to viewing what they will be making. The Christmas Teas, with selected festive stalls, were held in the newly refurbished Methven Hall in late November and included a fine selection of home baking. 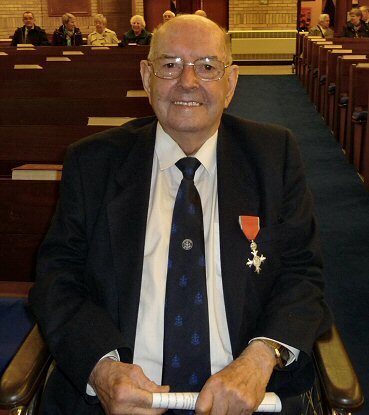 John Methven's 80 years association with the Boys' Brigade as boy, officer and leader was celebrated at a special service on 29th November. Many old boys were present to see presentations to John and to hear him speak of his long service. In association with this event an exhibition of Boys' Brigade memorabilia was hosted the Methven Hall. Special guests included some Scottish leaders of the B.B. John joined the Brigade when he was nine, whilst attending Dunnikier Primary School and fondly remembers his milk rounds in Kirkcaldy as a young boy. He worked his way though the ranks until becoming captain of the 4th Kirkcaldy until his retirement in 2015. Did our captain know where his future lay? His chart was drawn from an early day. eighty years he's served. His rest is due. awarded by the Queen his M.B.E. saw John in charge, to the boys' delight. and the bible class taught God's object. their captain's words stayed with everyone. Now his life-time duty is at an end. The call he heard surely God did send. He would answer well, gave the right reply. His work is done, eighty years flown by. John sent us a message of thanks for the day - "Very many thanks to everyone for their kindness, thoughtfulness and generosity in celebration of my 80 years involvement with the Boys' Brigade. I’ve received many cards, visits and unexpected ‘phone - calls - I’m fair embarrassed! The service was excellent, and I enjoyed & appreciated meeting up with friends and ex-members, both in the Church and also at the Lunch afterwards at the Victoria Hotel. Thanks a million to everyone. The year ended with the usual selection of Advent services including a service of carols and lessons led by the Choir, a performance by the Sunday School and the Christmas Eve watchnight service. New this year was a glittery Messy Church afternoon which included a meal. 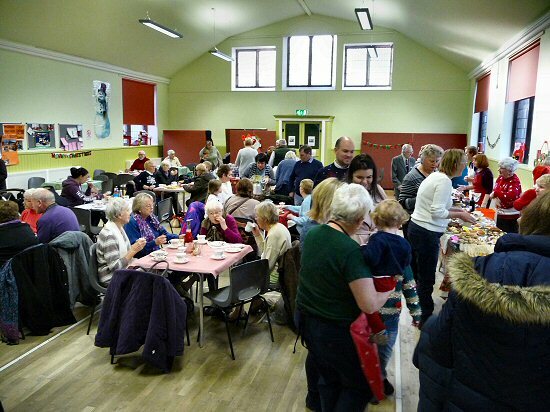 The last event of the year was a joint town centre churches service held at Bennochy Church.